Supreme Court Justice the Honorable William Boller installs the 2018 Blossom Fire Company Officers. FIRE COMPANY OFFICERS: Mark Schaefer, Cheif; Don Gold,1st Asst. Chief; Mark Kowalski, 2nd Asst Chief; Matt Gold; 3rd Asst. 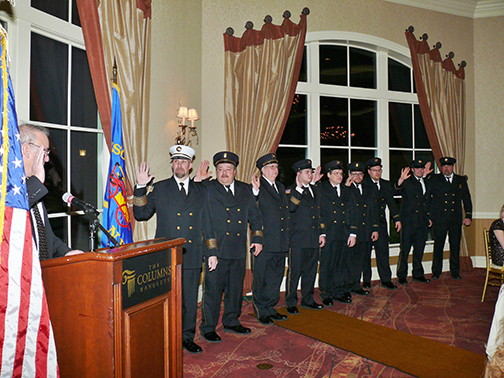 Chief; Tom Schaefer, Frist Aid Captain; Joe Gold, Rescue Captain: Steve Kowalski, Fire Captain; Paul F. Derkovitz, Fire Police Captain; Argo Captain, Paul L Derkovitz.